The GV-Hot Swap Backup Center System, designed for large-scale video surveillance deployments, provides a secure remote backup solution with a powerful data storage capacity for the GV-System and GV-IP Devices. It comes with a selection of 4U (20-bay) or 3U (16 / 8-bay) hot-swappable SATA mobile racks. Depending on the HDD size, the GV-Hot Swap Backup Center System can store up to 120 terabytes of recorded data. The built-in GV-Backup Center can automatically store a copy of recordings and logs to the offsite location. Using the GV-Backup Center, the recording data remain safe in a different location if the GV-System, GV-IP Devices and GV-Recording Server are damaged. 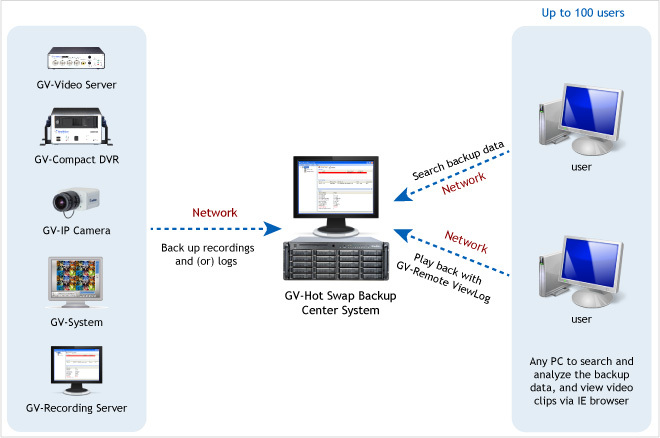 The GV-Hot Swap Backup Center System, equipped with 4 network interface cards, has the capacity of receiving 200 hosts for GV-System and GV-IP Devices. It can also receive up to 100 users for Web query or remote playback. It is recommended to set three network interface cards for receiving video and one network interface card for Web query or remote playback. The system’s backup speed and transmitting capacity depends on the number of Gigabit connections. The numbers of Gigabit network cards required to receive 200 hosts and to support remote access of backed up data are listed below according to the resolution of the source video. Also note the maximum number of hosts supported by a single hard disk to calculate the number of hard disks required. For example, at least 7 hard disks are required for up to 200 hosts supported with 1.3 / 3 M resolution. ** By replacing 2 built-in single network cards with 2 optional dual network cards, the GV-Hot Swap Recording Server System can support up to 5 gigabit ports.